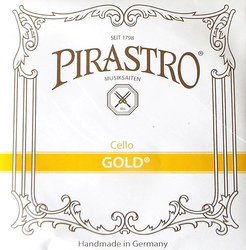 Gold or Gold Label are entry level covered gut strings for those who like the old style strings but don't need the wide range of choice offer by Eudoxa and Oliv. A good choice for keen amateur players in smaller groups they produce a bright, clear sound. As with all gut based strings due to their elasticity they are not recommended for use in fine tuners.